Do YOU feel unloved, unwanted, or angry? Are YOU tired of hurting physically, mentally, emotionally, or spiritually? Are YOU “WILLING” to set DEPRESSION or ANXIETY FREE and Live in Harmony? 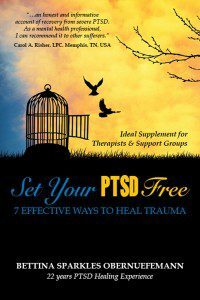 Are YOU “WILLING” to set PTSD FREE and Live in Harmony? Set Your PTSD Free answers your questions to find the Love you yearn for. Author narrates her Child Abuse Recall. The author reveals shocking details of the “recall” of Child Abuse memories which led to the PTSD diagnoses, healing and wonderful spiritual journey. SET YOUR PTSD FREE is not about denying PTSD, it is actually the opposite. There’s nothing to be ashamed about our reactions to fear. Instead, we use the obstacles as opportunities for growth of our emotions and our souls or spirits. This life story has a happy ending because “Sparkles” can talk about the horrific past without hurting anymore. Author, lives daily, feeling the Presence of love and harmony with all there is. Healing expands our minds and spirit. We finally feel Peace of Mind.